In this episode, infection spreading through the Digital World? Have you tried turning it off and on again? While the first three parts of Confession had plenty of character, angst, build-up, and even a little exposition, what we haven't had is... well, nothing's actually happened. Just some attempts at questioning, some foreboding warnings, and the Digimon realizing those warnings mean something unpleasant is going to happen. It's a long, torturous burn as everybody puts their all into an intense fight, punctured with encouraging moments that trick us into thinking we've reached a turning point and things aren't going to end up quite so bad. After all, how many fights in the past reached a point where the odds seemed impossible only for a miracle to appear? It never arrives. In the end, we're left with nine kids staring at the aftermath of a catastrophic failure. What's particularly tragic is the nagging feeling that it didn't have to end like this. For the first time, all eight have their Digimon evolved and in the fight. Previously reluctant fighters Taichi and Joe were the first on the scene. Each successive appearance heightens the feeling that we're getting back to the team we remember being able to do anything, especially when Angewomon and MetalGreymon show up- the first time we've seen Perfects that don't immediately lead to Ultimates. They must have been strong enough to stop Meicoomon. But mistakes before and during the battle catch up to them, leading to this result. Start with Meiko, whose reckless charge into the fray is the first sign that there isn't a miracle in store for them. In fact, they actively prevent one. It's fair to question Meiko's unwillingness to answer questions and later to go to the Digital World, but here she is rushing ahead to try to reach Meicoomon. It's unlikely that she would have been able to get through and somehow heal her partner with the bonds of friendship and all that. But we've seen that exact thing happen before, and the rest of team doesn't know the history of their relationship. Yamato argues that any harm coming to Meiko would agitate her partner further, but if that were true, doesn't it stand to reason that Meiko's love, faith and courage could have the opposite effect? At this point, anything's worth a try, and denying it shows fear and a lack of imagination. Takeru shows plenty of fear when he tries to keep Patamon out of the fight. Unfortunately, this fear was warranted. Angemon turning on the team seemed to kick off everyone else being infected. Whether or not he was the cause, Takeru shouldn't have had to hold Patamon back by himself. It was his refusal to tell the others that left him alone in this fight. Had he been honest, the others may have joined him in stopping Patamon, or perhaps kept him away from the distortion entirely. Who knows if it would have made a difference, but suddenly the infection spreads, Meicrackmon is loose again, the sky in the digital dimension turns red and the countdown starts. All of the Digimon are fighting to prevent the reboot, but this is new information for most of the kids. Suddenly they realize the stakes of the battle: their partners' memories. Had the Digimon told them sooner, they might have a better understanding. Had Meiko told Koushiro how Meicoomon caused the infections, Koushiro may have been able to execute his plan before everything got so drastic. As it was, his plan felt rushed and desperate from the moment he explained it. His backup field, which in theory would clear Digimon of the infection and restore them back to a healtier point, would have been much easier to execute had he installed it when they still had a numbers advantage. By the time Tentomon was sent out to corral everyone into it, it was already too late. But Tentomon tried anyway, refusing to be saved alone and accepting the unknown fate of living or dying with his comrades. Infected as they were, the others seemed to acknowledge their bond, piling onto his Ultimate form as he makes one last gasp effort to draw them into the backup field. He was never going to make it, but he pulls them back into the digital dimension as time expires. Whatever their status, and whatever happens to them, they were venturing into the unknown together. Much as Meiko's plan to try to talk Meicoomon down was worth a shot, her voice did seem to trigger her partner's evolution. Even though we saw Ultimates in the first two movies, we're conditioned to wonder if Perfect evolutions like Angewomon and MetalGreymon should be possible at this point. It's like the curse of all the nerfing from Zero Two. It's fair to ask why there wasn't more of this in the Alphamon battle, but most of them did go down pretty fast. 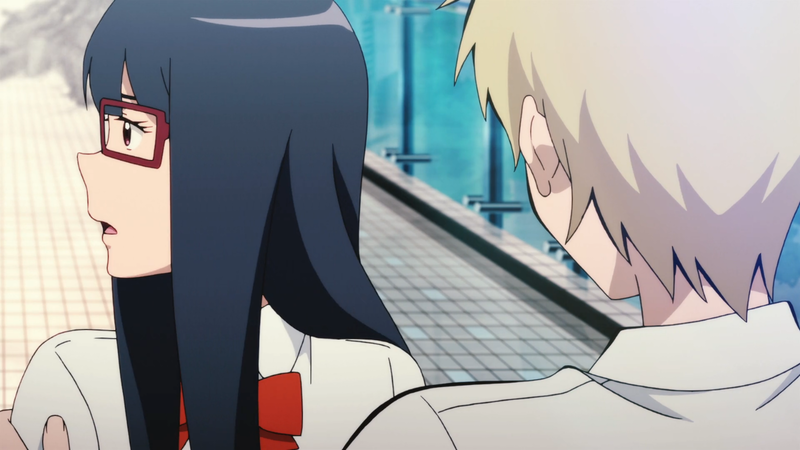 There's a real question about whether Koushiro figured out the base of the infections. If he did, it wasn't a big revelation, but the information would theoretically be required for him to activate the backup field. If not, the only way the field works is if he already had healthy backup data for all of the Digimon. Only with that could he use the backup field in a similar fashion to a... ahem... system restore. Somewhere in the middle of Tentomon's last stand, infected MetalGreymon evolved on his own to WarGreymon. That's not a good sign. The first time I watched this, I assumed the movie would once again only be four episodes. This would have been a hell of a way to end the movie. And yet it's hard to say it would be a bad way to end the movie. Labels: movie, sacrifice, that's suicide, tri. I loved this episode, the music and tension was so good. I saw the last scene as the digimons bonds of friendship winning out and they huddle together and well sacrifice themselves together. A great episode and great analysis! It was such a relief to find out there was a fifth episode. Like you said, it wouldn't be a bad place to stop, but it would be too depressing. On the other hand, I've read people saying that, since the fifth episode takes place a week after the events in the fourth, that episode would make more sense as some sort of Special, to broadcast half-way between Confession and Loss. It would be an interesting idea. 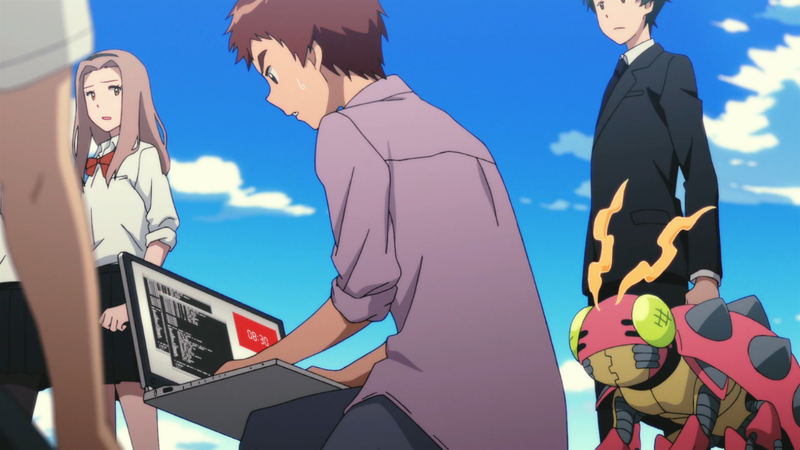 Koushiro's backup field would protect memories of Digimon during "Reboot". So this can't be used in another moment. I don't think backup field can cure the infection.